Here’s a standard home network. One external IP and one LAN. LAN1 would represent the entire network in the first image in this post. 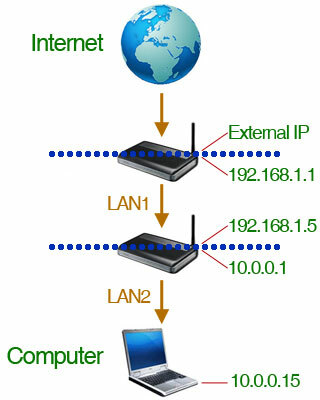 LAN2 would be the home lab network. 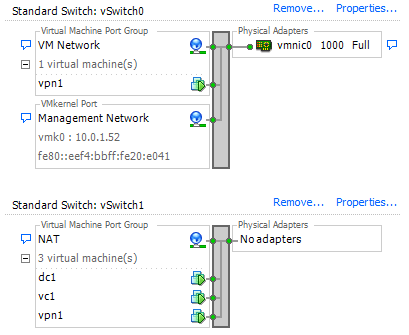 Connect the one physical NIC on the ESXi laptop to the physical switch on LAN1. Setup two virtual switches. vSwitch0 has the physical NIC attached to it and is the management network for your ESXi host. vSwitch1 has no physical adapters. Of course, vSwitch1 VMs can’t get out to the world yet and can’t even communicate with each other unless static IPs are set. Windows RRAS will solve that problem next! ← Home lab (part 1): is it worth it?